By exploiting the fundamental basis for the stability of collagen (which is the most abundant protein in humans), we are creating new materials to detect and treat wounds, tumors, and other abnormalities. For 25 years, the prevailing paradigm had been that the enhanced stability from the post-translational modification of collagen by the enzyme prolyl 4-hydroxylase arises from water molecules that form bridges between the hydroxyl group of (2S,4R)-4-hydroxyproline (Hyp) residues and a main-chain oxygen. We recognized that the hydroxyl group could instead have stereoelectronic consequences that stabilize the desired conformation. To test this hypothesis, we synthesized collagen chains in which (2S,4R)-4-fluoroproline residues replace Hyp. These chains form triple helices of extraordinary stability, despite the inability of organic fluorine to form strong hydrogen bonds. In contrast, the diastereomeric (2S,4S)-4-fluoroproline was highly destabilizing. These data were the first to demonstrate that a stereoelectronic effect can stabilize a protein structure. We replicated the stereoelectronic effects with reciprocal steric effects (e.g., using 4‑methylproline residues), ultimately creating the most stable known triple helix. We are now translating our knowledge into a preclinical context, and have shown that collagen mimetic peptides containing 4‑fluoroproline residues can anneal to damaged collagen, forming a tight, noncovalent interaction. We are exploiting this peptidic “pylon” to anchor molecules in damaged collagen, providing a new modality for the diagnosis and treatment of wounds in a variety of contexts, including near tumors. In addition, we are developing potent, selective, and bioavailable prolyl 4‑hydroxylase inhibitors, which have promise as antifibrotic and antimetastatic agents. Strategy for anchoring a molecule (X) in a wound bed. A natural strand (yellow) in weak or damaged collagen is displaced by a synthetic collagen mimetic peptide (red) that forms a hyperstable triple helix. A pendant dye enables wound assessment; a pendant growth factor expedites wound healing. Collagen comprises 1/3 of the total protein in humans and 3/4 of the dry weight of human skin. 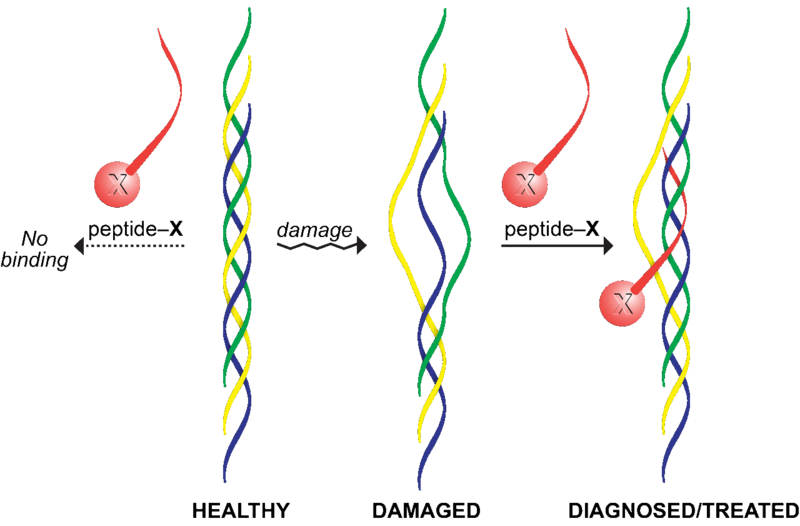 Natural collagen triple helices are, however, >20-fold longer than are the typical triple helices formed from synthetic peptides. We are using the self-assembly of peptides and the mathematics of tessellation to create human-scale triple helices. This synthetic collagen is a versatile soft material with myriad applications in medicine and nanotechnology. Atomic force microscopy image of synthetic collagen nanofibers. Treating the self-assembly of synthetic peptides into triple helices as a “tiling problem” yields long (1 µm), thin (1 nm) fibers. Cellulose, which is a polymer of glucose, is the most abundant biological material on Earth. We developed the first one-step process to convert crude lignocellulosic biomass (e.g., forestry waste, crop residues, prolific grasses, or even recycled paper) into a commodity chemical: 5-hydroxymethylfurfural (HMF). HMF can be readily transformed into a variety of useful acids, aldehydes, alcohols, and polymers, as well as into 2,5-dimethylfuran, which is a fuel comparable to gasoline. Our process can also produce sugar (which supports the robust growth of bacteria and yeast) in nearly quantitative yield. Technoeconomic analyses indicate that our route to fermentable sugar is superior to extant industrial processes that rely on concentrated acids or enzymic catalysts. 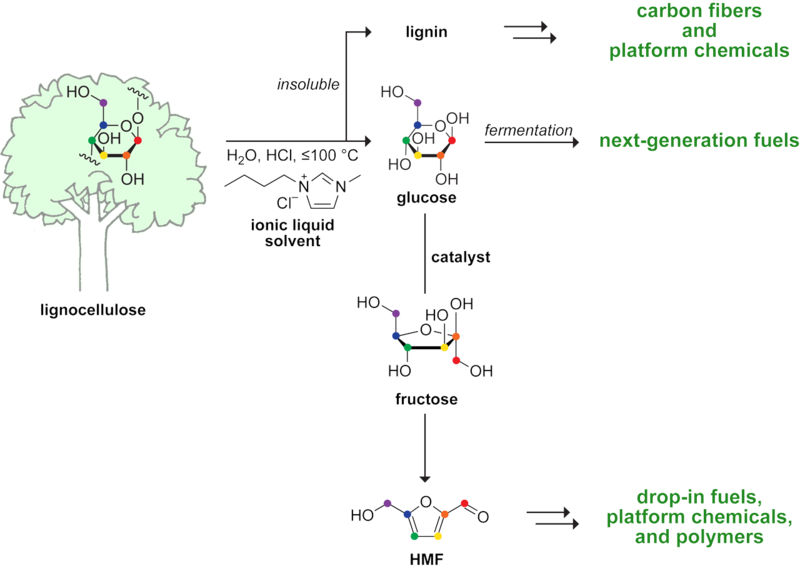 Route for the efficient conversion of crude biomass into fuels and chemicals. The feedstock-agnostic process relies on an ionic liquid (here, [BMIM]Cl), which dissolves cellulose but not lignin.